NEW YORK -- An estimated 103.4 million people watched the Philadelphia Eagles beat the New England Patriots in the Super Bowl, the smallest audience for television's biggest yearly event since 2009. 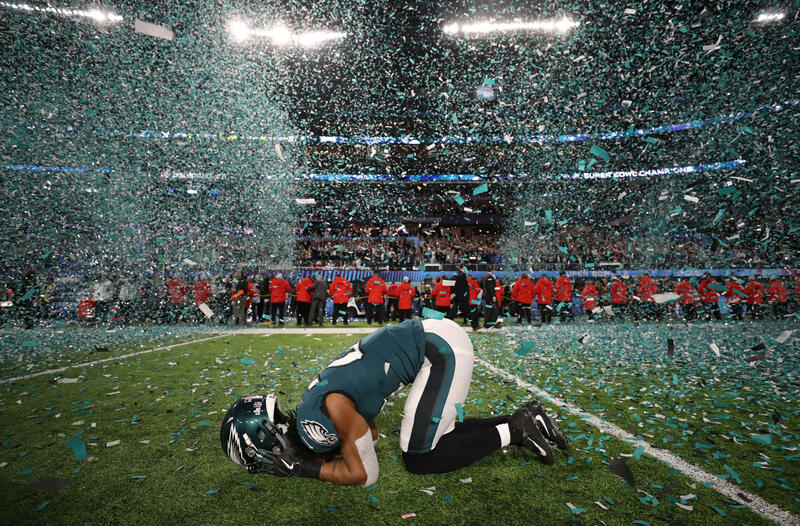 Eagles pulled off a stunning win over the Patriots, 41-33, for their first championship in history. The NFL's viewership has been down this season, and so has television watching in general. The audience decline came despite a thrilling game that was competitive from beginning to end. Big moments widely shared on social media included a fumble by the Patriots in the last couple of minutes of the fourth quarter that nearly sealed the Eagles' destiny as NFL champions this year. Meanwhile, NBC's post-game episode of "This Is Us" was seen by 27 million people, the most-watched entertainment program after the Super Bowl in six years. Despite the decline compared to past Super Bowls, the big game still pulled tens of millions more viewers than anything else on television over the past year. In addition to watching the game itself, many tuned in for the halftime show headlined by Justin Timberlake, which included a tribute to late singer Prince, and many of the TV advertisements this year definitely turned heads. The Super Bowl is a high-stakes game for advertisers, who shelled out $5 million for 30 seconds of air time this year. Add in production costs and pre-game promotion, and an advertiser can easily spend double that on their game-day message. Advertisers will closely watch not only which commercials score well with viewers, but the demographics of Super Bowl viewers. Some analysts have speculated that demographic changes are to blame for the NFL's ratings slump, given the tendency for younger viewers to become cord cutters and snub cable or network broadcasts. "If this past NFL regular season and playoffs serve as a guide, odds are that more Americans will tune the game out than last year," Michael Nathanson, an analyst at MoffettNathanson Research, said. CBS News' Aimee Picchi contributed to this report.